The first time I met him, it was barely minutes after arriving in the Slovenian coastal resort of Koper. It was September 2001. We were fresh off the bus, from Ljubljana if I recall correctly. While Niall watched the bags I was despatched into town to suss out our intended accommodation options. I must have looked like an English speaker because the stranger addressed me in perfect English and with sincere politeness, asking me if I knew where a cash machine was. He was casually dressed, of Middle Eastern ethnicity and sported a neat beard. I’d have put him in his early thirties, and his silent companion around the same age. I informed them that I was, unfortunately, new in town myself and I had no idea. We exchanged goodbyes and continued our respective hunts. We stayed two nights in Koper, I think, after the successs of my mission to check out the hall of residence in our guide book that doubled as a hostel out of term time. It was either later that day or the next when we met him again, with a different companion, sitting on a park bench. He had a can of beer in one hand and a mobile phone in the other. He and I recognised each other and said hello. We all got talking. Ishmael, as he introduced himself, was chief engineer on a cargo ship that was docked for a couple of days in Koper, one of the few port towns on Slovenia’s narrow wisp of coastline. He and his crew were Syrian. Raising the phone, he explained that he was just about to call his girlfriend back home. He wasn’t much looking forward to the call, because his girlfriend always gave him grief for being at sea for so long. The beer, then, was for a bit of Dutch courage. Though that metaphor may not have been his exact words. He would work months at a time on the boat, and while he told us he loved travelling the world, he rarely saw more than the insides of a boat and the occasional port. He wanted to travel properly, to see places. Like we were doing, I supposed. We explained we were heading in the general direction of his homeland. We had no particular route or plan, only that we flew home from Cairo in early December. We’d heard good things about Syria though – the people, the scenery, the history, the warm welcome – and in our brief conversation on the street, Ishmael thoroughly reinforced that perception. He encouraged us to visit the country. We said our goodbyes and parted company again. He had a call to make; we had… well, whatever we were doing that evening. Same as most evenings on that trip, I suspect: walking around, taking photos, exploring, maybe finding some food or a quiet beer somewhere among the attractive streets of Koper. The next day, we met him once more, and we laughed together at the coincidence. He was coming out of a bar with yet another man, presumably a different colleague. We talked again, about Ishmael’s boat, the places he’d been, where we’d been and were headed on our trip, and again about Syria. 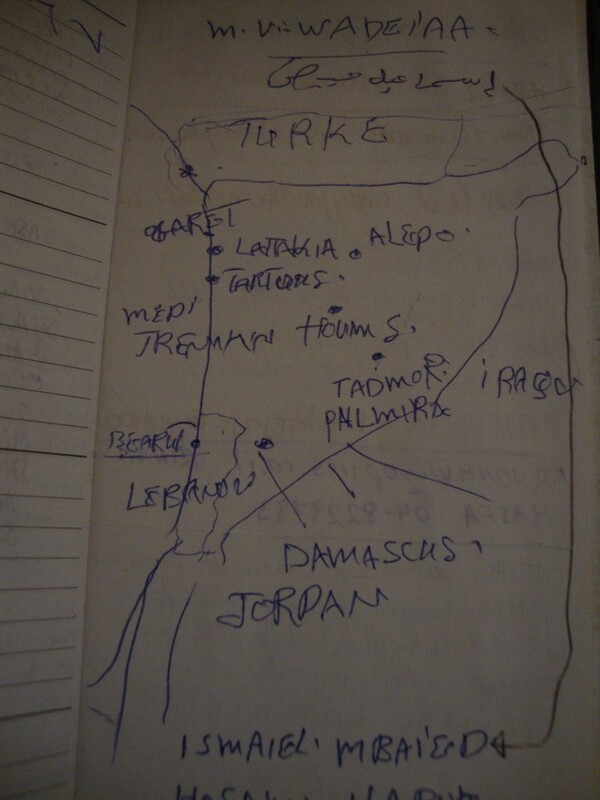 He wanted to write things down for us, so I handed him my notepad and he scribbled some things as he talked, including a rudimentary map of Syria in relation to its neighbours, with some of the main towns marked. He told us where the most interesting historical parts were (and there were many). He wrote the name of his ship, the Wadei’aa, and his own name in Arabic script. He urged us again to go see his country. I’ve thought occasionally of Ishmael and his colleagues, not least as Syria has hit the headlines in recent months as the latest theatre in the Arab Spring. I found my notepad by chance in a box in the attic the other day while looking for something else, and thought of him again. His quick doodles include names of Syrian towns and cities – Damascus, Aleppo, Homs – that are all too sadly familiar for the violence now raging there. I wonder how Ishmael is. I wonder whether he’s been caught up by the revolution breaking out across his country. I wonder if he’s still at sea. I wonder if he married his girlfriend. We never made it to Syria. Such was the aimless meander of our trip that we dawdled our way through the Balkans (there’s a whole host of other stories to tell from there) and left the Middle East with far too little time. In any case, we needed to go through Israel, so also visiting Syria would have created too many visa issues. Who knows whether I’ll ever get to Syria. I really hope so. It sounds too good to miss. And I have recommendations to follow up.